How can you get more business this holiday season? Why, by trying some of my Top Secret Social Media Tips of course! Armed with the knowledge below, and a healthy supply of “special” Egg Nog fortitude, you will be working your way up Santa’s List. We’re going to explore why knowing your audience is paramount. I’ll show you how blogging can be a fun way to gain exposure for your business. Finally, I will share tips to help you reach your audience. Facebook, Twitter, YouTube, it doesn’t matter the Social Network if you don’t know who your audience is and how to speak with them. Before spending a penny on advertising, branding, design, etc., have a plan. Firstly, why does your company exist? What need does it fulfill? Communicating “the Why part,” is the most natural way to form a relationship with a potential customer or client. We are all drawn to people and companies that know their purpose. For example, if I said to you, “I’m a Sports Trainer. I like working with people. I like to see people achieve their goals. Would you like to start my program?” My guess is no. The message doesn’t tell you why I do what I do, nor is it compelling. Let me communicate why first, and see what happens. “My passion is experiencing the athletes I’ve worked with surpass their goals! I believe my innovative methodology, firsthand experience and goal setting, coupled with my ability to form deep trust with my clients, allows me to help athletes perform at their highest potential. When would you like to start?” That sounds completely different. By starting with why, you compel your audience, and Social Media is the way to cast the biggest net. My Grandfather sold real estate for over thirty years. He summarized the totality of his experience in one phrase, “People don’t buy the steak. They buy the sizzle.” Social Media is where you share your sizzle! Tip: Communicate why you do what you do, and you will find your core audience. These people will be your company’s evangelists and help you grow. Don’t underestimate your audience’s power. As social creatures, we are programmed to have an affinity for people, more than any other piece of the business puzzle. What is a great way to interface directly with your customers or clients? You guessed it, a blog! Share yourself and, or, employee ideas, talents, prose, fun prizes, and anything else you want. The imagination is the limit. Best of all, a blog does not have to be difficult to setup or use. A blog should be fun, don’t overthink it. For technology, I highly recommend WordPress because it’s easy to use, easy to learn, is scalable, and allows as many contributors as you desire. The important part is jumping in and doing it. Worry about the finer details after you’re off rolling, or you will never start the journey. 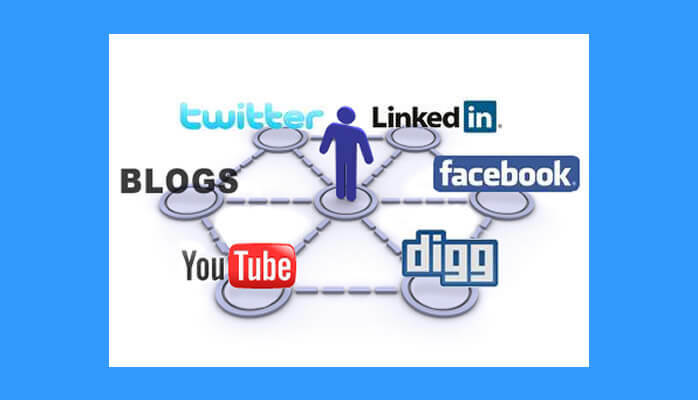 Tip: Share from your blog to Social Media, and not the other way around. Let your blog be the hub, and sharing content its spokes. Here’s my favorite “Top Secret” Social Media trick, add more data! Let me explain. Much like search engines, “social feeds” are based on relevancy. So how can one make a post, pin, video, or photo more relevant? Add things like a physical location, which you can do on many Social Networks, add a relevant product or service in Facebook posts (see image), add a location AND relevant details to your YouTube videos. All of this “extra data,” gives your hard work a greater chance of reaching its intended audience. Hashtags, sparingly, are another piece of relevant data to add. Be in the habit of adding as much info as each system allows. The pin below (see image) is from my personal Pinterest account. At about 80 Repins, I utilized the newly available mapping feature to add the physical location to the pin. The pin is well on its way to 1,000 Repins, all having the URL of my Website. This boosts your Natural SEO, it drives traffic, and it doesn’t cost anything! Tip: Add as much “bonus” data as you can. The more relevant the additional data, the better chance you will have of reaching those you want to reach. All this writing has made me hungry! I’m headed for Pumpkin Pie and tea. I hope you have found this post helpful. The crucial reason I have seen businesses struggle with Social Media, is that they lose track of the “social” part. Focus your message on why your business does what it does. Encourage people to “follow” you that believe what you believe, and appreciate the need that your business fulfills. Most importantly, Social Media can, and should, be fun!